I hear constant chatter that The Walking Dead (both the comic and its companion television series) is not about zombies at all, but about the struggle for survivors to retain their humanity. Robert Kirkman himself has confirmed this. Horror is used as a backdrop to the human condition. As a writer, this is a tactic I can relate to, and also one I have often employed in my own work. The zombie is The Other. The idea of The Other is an ancient one, its themes expressed in all factions of art, gaining philosophical popularity in the 20th century when intellectual minds such as Jacques Lacan and Michel Foucault developed it into a concept with the potential to impact all humans. Broken down into its simplest form, The Other refers to that which is different—a person who does not fit within the confines of society’s accepted box. In The Walking Dead, people from all walks of life and racial backgrounds are forced to work together despite their differences or face extinction. One can easily see this theme at play in both the comic and the television series. Cooperation does not always prevail amongst these groups, but those who continue to survive the harsh conditions understand that there is no room for The Other in human society; everyone needs a role. As a result, the idea of The Other becomes displaced, shifting instead to the undead. To most humans, this is a convenient solution, one that does not cause any loss of sleep at night. Though the undead have faces and traces of identities from former lives, those have been abandoned in an infected world. Humans make the mistake of thinking that the zombies are not “us,” when they are in fact the lurking unrealized potential of humanity. From here it is just a short leap to labeling the undead as The Other; a zombie’s only instinct is to consume the living, which often results in the transformation of a living person into their ranks. This is where a thick grey fog begins to gather over this particular theme of The Walking Dead. When a member of the undead horde is simply the shell of someone a character has never met, it is much simpler to dismiss the zombie as Other and destroy it in the name of survival. When someone a character has held conversation with or learned to love becomes infected, it then becomes much more difficult to view them as Other. Take the Governor for example. For all his terrible qualities and failures at humanity, he refuses to let his niece (or—in the television version—his daughter) Penny be known to the world as a zombie, and he cannot bring himself to kill her himself. He knows that death is the only fate for The Other in this new world. Not just rejection and isolation, but total eradication. The Governor does his best to treat her as close to normal as is possible, but the concepts of normalcy have been twisted. Was he insane, or was he able to acknowledge something human still lingering within Penny? And where exactly is this line drawn? Once any human becomes referred to as “it” versus “he” or “she,” the label of The Other automatically transfers over. But at what point does this transition occur? When a zombie bites a man or woman, their death is imminent save for a lucky quick amputation such as when Dale is bitten on the leg (again, this differs slightly in the television series; it is Herschel who falls prey to this near demise). The victim is treated as sort of a Transition Other, often quarantined from the rest of the group and taken care of by those closest to him or her. More often than not, the bite victim receives a bullet through the head immediately after death takes them. This allows the once thriving human to avoid regressing into the undesirable Other. Before the apocalypse occurred, most humans wanted to know what existed—if anything—on the other side of death’s tunnel. In the new world, there is almost a unanimous decision to avoid this completely. 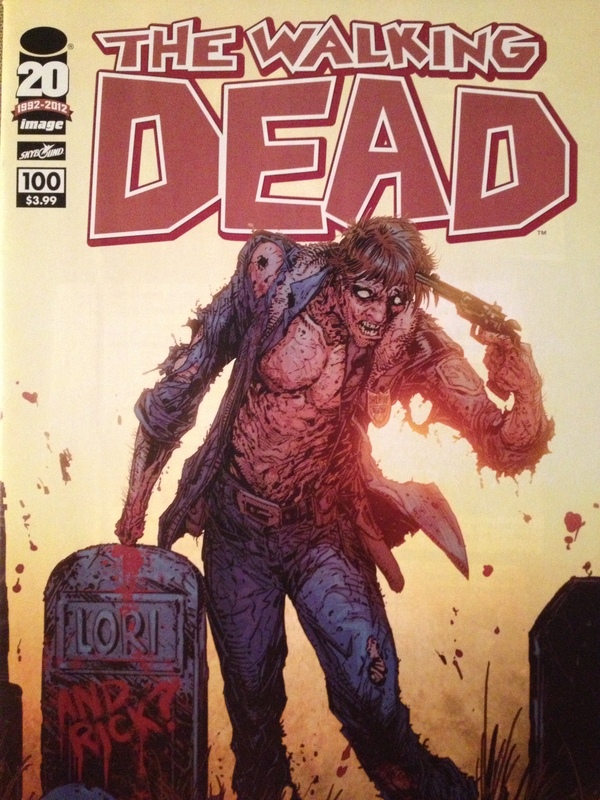 A notable exception would be the character of Jim, whose comic and television personas both face the same sad fate—after being bitten, he wishes to be left alone to follow through with his transformation, hoping in some disturbed way that he will be able to reunite with his fallen family. What would it be like to enter the psyche of the undead, if such a psyche even exists? It would take the hand of a careful writer with serious intentions to handle this idea. The recent film Warm Bodies was overall surprisingly successful in capturing a humorous take on this vision, though I am not familiar with the novel it was based on and to what depth it might explore this same idea. As much as I am fond of satirical approaches, I think the psyche of the undead deserves deeper examination. I often recommend the little seen 1998 film I, Zombie: The Chronicles of Pain, which features a decidedly more depressing take on the subject matter. These questions are worth asking: Would a zombie, in fact, retain any sense of their former self and feel some dark regret that can never be mended? Would a reader ever be capable of experiencing some level of pathos for the undead instead of sheer disgust? It’s hard not to pity such a creature when the specifics of its existence are spelled out. Once a human with a family and dreams for the future now reduced to a cannibalistic ghoul with nothing left beyond instinct and hunger. How much of a stretch is this fate from those afflicted with terminal illnesses—their bodies wasting away into glorified mummies, or coma victims with no more to offer than common garden vegetables? Humans can only speculate about this. Much like we can never truly tap into the mind of non-human animals, it would be near impossible to do the same with a zombie. Of course, this entire angle may not even be applicable to The Walking Dead, but that does not make it any less fascinating to ruminate upon. Perhaps I’m reaching too far within the themes of The Walking Dead, but I am a firm believer that any successful piece of horror art is worth analyzing beyond the surface. There are reasons why so many readers connect with this series; what those reasons are will forever be up for debate. For many—including myself—it is the characters. Without a core group of survivors to identify with, there is no hope to cling to and the entire story falls apart. The few that have managed to survive over the comic book’s entire arc often feel like distant family for the moments that I am turning the pages, so much so that it was crushing to witness my favorite character receive the most brutal death of all in issue #100 (I won’t spoil who that was for those who have not made it that far into the series, but if you aren’t emotionally demolished by that scene then it is possible that you have become a zombie yourself.). Will we ever grasp the extent of death and the great beyond? At this point, the zombies are much closer to understanding this than humans ever will. Chad Stroup is currently pursuing his MFA in Fiction at San Diego State University. His work has most recently been featured in Fiction International, The Newer York, Coffin Catalogs, and an exciting new horror anthology titled Splatterlands. His blog, Subvertbia, is a showcase of some of his short fiction and poetry. http://subvertbia.blogspot.com/. Like him on Facebook at https://www.facebook.com/ChadStroupWriter.